Riders to pedal 850-kilometres to raise awareness and money for cancer research. Cops for Cancer riders enter Abbotsford secondary school on their bicycles for the kickoff of this year's Tour de Valley. The Canadian Cancer Society’s 2015 Cops for Cancer Tour de Valley got off to an emotional start Thursday morning at Abbotsford senior secondary school. With hundreds of students and law enforcement officers looking on, five-year-old Greta Loewen distributed hand-made ribbons to the riders, as they prepared to embark on their 850-kilometre nine-day journey to raise awareness and money for pediatric cancer research and Camp Goodtimes. The riders will journey from Abbotsford to Boston Bar to Tsawwassen, stopping at businesses and dozens of schools along the way. Loewen was joined by other childhood cancer survivors. but the absence of one young man long-affiliated with the Tour de Valley was also felt deeply. Earlier this year, Brandon Radnai, a childhood cancer survivor from Mission who was closely involved with the Tour de Valley, died in an accident. His parents were at this year’s kickoff and were given an emotional standing ovation. “Today’s a beautiful day, but it’s also a difficult day because we’ve lost one of our own,” said Canadian Cancer Society regional director Allan Mugford. He saluted the students for their own fundraising efforts. “Without your input and your financial input, nothing will change. Thank you,” he said. 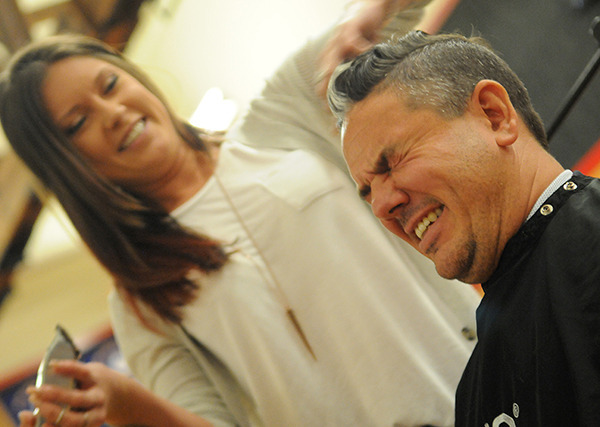 The event had plenty of levity, however, with Abby senior secondary principal Adam Moore getting his head shaved to the delight of his students. Moore had promised to shave his head if students raised $1,000. That goal was demolished, with $4,300 eventually being raised. Along with Moore, Sandy Hill elementary student Kayden Shaver also had his head shaved. He had raised $350 on his own for cancer research. Kayden Shaver gets his head shaved after raising $350 for cancer research. Riders come from a range of law-enforcement organizations, including local police departments, corrections facilities, and the Canadian Border Services Agency, among others. 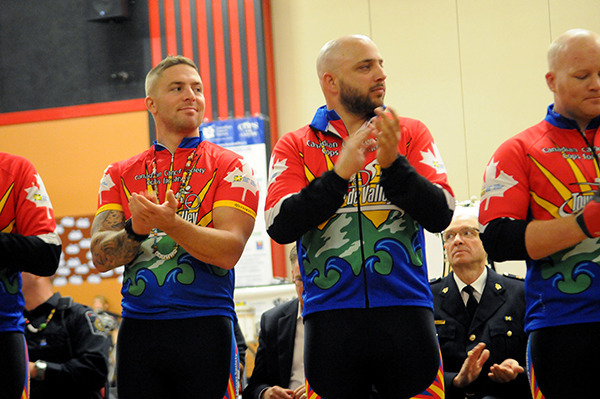 They have been training – and raising money – for months and hope to bring in more than $465,000 in donations this year. Since 1994, Cops for Cancer events and rides have raised more than $50 million. For information on how to donate, visit copsforcancer.ca. The nine-day tour kicked off Thursday Sept. 24 in Abbotsford and will touch several Fraser Valley communities.